Baranifard, M., Khazaei, M., Jamshidi, S., Zarshenas, M., Zargaran, A. (2017). A critical comparison between dosage forms in traditional Persian pharmacy and those reported in current pharmaceutical sciences. Research Journal of Pharmacognosy, 4(3), 67-74. M. Baranifard; M.M. Khazaei; S. Jamshidi; M.M. Zarshenas; A. Zargaran. "A critical comparison between dosage forms in traditional Persian pharmacy and those reported in current pharmaceutical sciences". Research Journal of Pharmacognosy, 4, 3, 2017, 67-74. Baranifard, M., Khazaei, M., Jamshidi, S., Zarshenas, M., Zargaran, A. (2017). 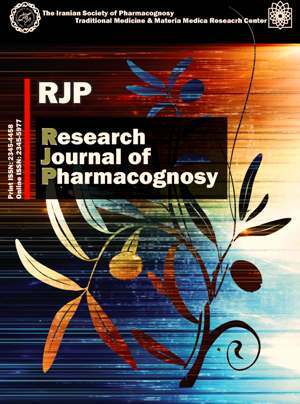 'A critical comparison between dosage forms in traditional Persian pharmacy and those reported in current pharmaceutical sciences', Research Journal of Pharmacognosy, 4(3), pp. 67-74. Baranifard, M., Khazaei, M., Jamshidi, S., Zarshenas, M., Zargaran, A. A critical comparison between dosage forms in traditional Persian pharmacy and those reported in current pharmaceutical sciences. Research Journal of Pharmacognosy, 2017; 4(3): 67-74. 1Department of Phytopharmaceuticals, School of Pharmacy, Shiraz University of Medical Sciences, Shiraz, Iran. Research Office for the History of Persian Medicine, Shiraz University of Medical Sciences, Shiraz, Iran. 2Department of Phytopharmaceuticals, School of Pharmacy, Shiraz University of Medical Sciences, Shiraz, Iran. 3Department of Phytopharmaceuticals, School of Pharmacy, Shiraz University of Medical Sciences, Shiraz, Iran. Medicinal Plants Processing Research Center, Shiraz University of Medical Sciences, Shiraz, Iran. 4Department of History of Medicine, School of Traditional Medicine, Tehran University of Medical Sciences, Tehran, Iran. Department of Traditional Pharmacy, School of Traditional Medicine, Tehran University of Medical Sciences, Tehran, Iran. There were many natural pharmaceutical dosage forms cited by Persian pharmacists and physicians in the historical pharmacopeias (Qarabadins). This work aimed to perform a comprehensive study on “Qarābādin-e-Sālehi” (1765 A.D.), one of the main Persian pharmaceutical manuscripts defining traditional dosage forms. All traditional dosage forms as well as their definitions, descriptions and considerations were extracted by reviewing “Qarābādin-e-Sālehi”. Then, the textbook of “Aulton's Pharmaceutics; the design and manufacture of medicines” was considered to compare the medieval knowledge of pharmaceutics with current ones. Overall, there were 226 different dosage forms which have been cited in traditional Persian pharmacy. Since many of them were related to the preparation method, the final list of dosage form was shortened to nearly 60 items including solid, semisolid, liquid and gaseous forms. On the other hand, almost 40 forms with oral, topical, nasal, parenteral, vaginal and rectal routes of administration are mentioned as current dosage forms. Some of the dosage forms are similar or as the same in traditional and current pharmacy. But, there were too many novel dosage forms in traditional Persian pharmacy. There were 11 types of traditional nasal forms whereas, this route is still known as a novel route of administration. Also 5 different ophthalmic dosage forms have been cited in the textbook. Many of traditional dosage forms were designed according to the medical purposes. Several current dosage forms have roots in the historical definitions and can be found in Persian medicine. However, there are forgotten traditional dosage forms which can be modified and optimized in pharmacy nowadays. Zargaran A, Zarshenas MM, Hosseinkhani A, Mehdizadeh A. Jawarish, a Persian traditional gastrointestinal dosage form. Pharm Hist (Lond). 2012; 42(2): 24-25. Zargaran A, Ahmadi SA, Daneshamouz S, Mohagheghzadeh A. Ancient Persian pharmaceutical vessels and tools in Iranian archaeological museums. Pharm Hist (Lond). 2012; 42(4): 68-71. Zarshenas MM, Zargaran A, Muller J, Mohagheghzadeh A. Nasal drug delivery in traditional persian medicine. Jundishapur J Nat Pharm Prod. 2013; 8(3): 144-148. De Vos P. The "Prince of medicine": Yūhannā ibn Māsawayh and the foundations of the western pharmaceutical tradition. Isis. 2013; 104(4): 667-712. Hamedi A, Zarshenas MM, Sohrabpour M, Zargaran A. Herbal medicinal oils in traditional Persian medicine. Pharm Biol. 2013; 51(9): 1208-1218. Begum M, Ahmad A, Rasheed H, Syeed A. The valuble contributions by Unani physicians in “Qarabadin” (Unani medica). Ayushdhara. 2016; 2(6): 380-384. Hosseinkhani A, Zargaran A, Zarshenas M, Mehdizadeh A. Abkama, the first reported antibiotic in gastritis and infections throughout history. Pharm Hist (Lond). 2013; 43(2): 39-41. Khan M. “Qarabadeen azam”. New Delhi: Central Council Research of Unani Medicine, 2009. HA A. “Qarabadeen Qadri”. New Delhi: Aijaz Publication, 1998. Husain S. “Qarabadeen-e-Kabir“. Lucknow: Matba munshi nawal kishore, 1897. Heravi M. “Qarabadin-e-Salehi”. Tehran: Dar-ol-khalafeh, 1765. Farjadmand F, Shams Ardekani MR, Zargaran A. Wines as pharmaceutical dosage forms in 'Amal Saleh', as the last Persian pharmacopeia in the Zand era. Pharm Hist (Lond.). 2017; 47(1): 8-10. Alton M. Pharmaceutics, the science of dosage forms design. London: Churchill livngstone, 2002. Ramaa CS, Shirode AR, Mundada AS, Kadam VJ. Nutraceuticals-an emerging era in the treatment and prevention of cardiovascular diseases. Curr Pharm Biotechnol. 2006; 7(1): 15-23. Iqbal SZ, Asi MR, Jinap S. Natural occurrence of aflatoxin B1 and aflatoxin M1 in “halva” and its ingredients. Food Control. 2013; 34(2): 404-407. Zarshenas MM, Badr P, Moein MR. Laooq: selective respiratory dosage form used in medieval Persia. Pharm Hist (Lond). 2013; 43(2): 34-38. Karegar-Borzi H, Salehi M, Rahimi R. Lauq: a sustained-release dosage form for respiratory disorders in traditional Persian medicine. J Evid Based Complement Altern Med. 2016; 21(1): 63-70. Afsharypour S. Introduction to Iranian traditional pharmacy and pharmaceutical dosage forms. Tehran: Chogan, 2013. Zarshenas MM, Hosseinkhani A, Zargaran A, Kordafshari G, Mohagheghzadeh A. Ophthalmic dosage forms in medieval Persia. Pharm Hist (Lond). 2013; 43(1): 6-8. Mosleh G, Badr P. Qairooti (cerate or cera beeswax salve) in medieval Persia. Pharm Hist (Lond). 2016; 46(4): 72-74.